Inmate Winnie Yates speaks in “Mercy Find Me”, telling us in her own words about a hearing that happens off-stage in the legal thriller Help Me Nora. Winnie’s been in prison for more than fifteen years. She has one chance to convince her listeners to set her free today. 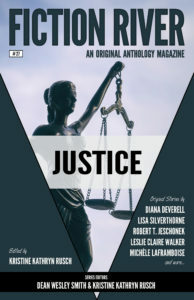 You’ll find Winnie’s story in Fiction River: Justice, an anthology of wonderful tales by many of my favorite writers. Also available in trade paperback from Amazon.